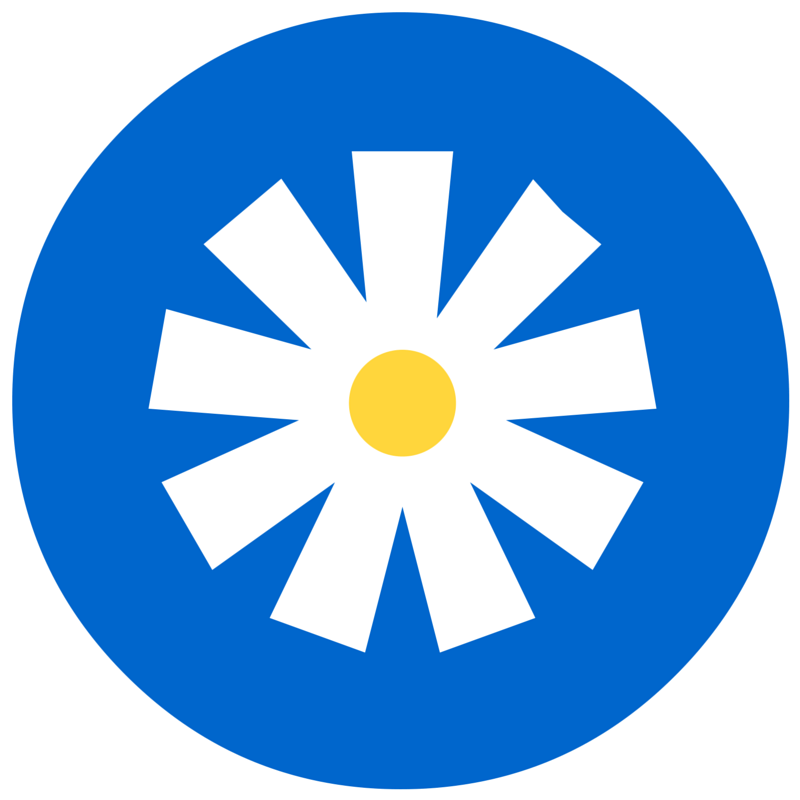 It’s been 17 days since I last wrote a blog post, which is blooming terrible, especially as I’ve actually made a rough plan for the next few too. How do I know it’s been 17 days exactly? Well the last one was on New Years Eve (seems like ages ago now) and because I’m currently keeping track of some of the things I do regularly, in order to see the places areas of my life than ‘need work’. More about that in a minute. 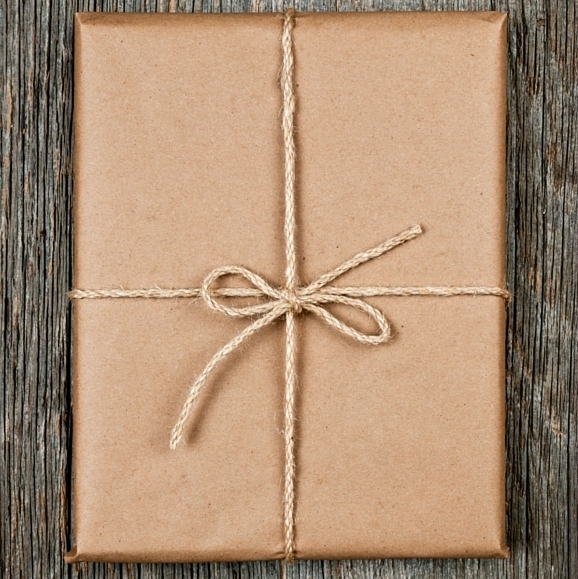 Did you think about a One Little word for your 2016? Despite my concerns about ‘putting it out there’, several friends have mentioned how positive they found my last post. How it made them think about their 2016 and have picked words too, including CONFIDENCE, RESTORE, STRONG and HAPPY. Each word definitely reflects the individual that chose it and I can’t wait to see how it impacts their year ahead. I’ve been busy test knitting a garment for the next issue of the magazine, due for release on the 26th January – eek! 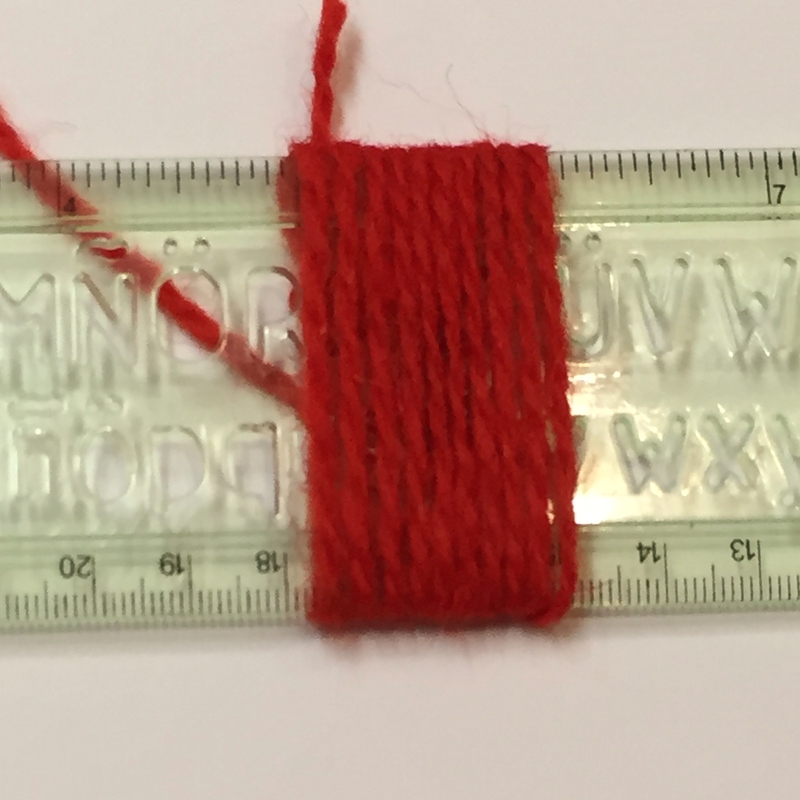 Deirdre and I have also been swatching samples for the Yarn Review feature, but I’ve spent the best part of the last fortnight stuck in front of my pc or unpacking and sorting out craft supplies, in order to begin scrapbooking my One Little Word. I’m happy to report that I’ve finished the granny square blanket I had been making for my youngest, Kye. He was thoroughly chuffed when I told him it was for him and he loves it. I might add another couple of rounds to it some time in the future, but for now I think the 75″ square is the perfect size for that extra bit of warmth. Much needed at this time of year, especially if you live in an old farmhouse that seems to eat the heat. Talking of cold, it really has been rather chilly of late. I finally gave in on Thursday and broke out the thermals, unable to take the sensation of numb legs anymore. It’s lovely to get out for a walk in the Winter sun, but I’m finding no amount of layers are keeping my hands or ears (?) warm. Today the sun hasn’t even been able to poke it’s way through the grey overcast cloudy sky, but I’m happy to see the fog lifted after last night. It was so thick that I found driving home in it close to terrifying and I would never think of myself as a nervous driver. I took my dogs out for a walk on the farm at 10pm last night, because I hadn’t had time earlier in the day and I couldn’t even see two fence posts ahead along the track with my torch. We’re in full ‘getting ready to publish mode’ and we keep getting messages from people telling us they can’t wait for the next issue. It’s easy when you’re so busy to forget to look after yourself and I’m extremely guilty of doing this, part of my hopes for the year ahead was to try and stem the chaos a little and have faith in myself. Putting this plan into action late again as per usual (but better late than never), I’ve started to keep a track of some of my daily routines and habits so I can see where I’m falling down. The table is basic a diary of sorts, there’s plenty of lines to fill in the things you want to monitor and the boxes on the right represents the days of the month. By checking or colouring in the boxes for the things you’ve achieved that day, you can see at a glance what’s happening. I only really started it on the 9th of this month, but it was easy to back fill some of the boxes. For me personally, I’m trying to establish a ‘baseline’ in some areas of my life, so I can work on them in the coming months. In no particular order I’ve tried to include things that I like doing, things that need doing, social media is there to ensure I remember, things I have to watch and things I’m aiming for. Knitting & crochet is there at the top as this is my sanity, meditation and mindfulness time all wrapped up in one. 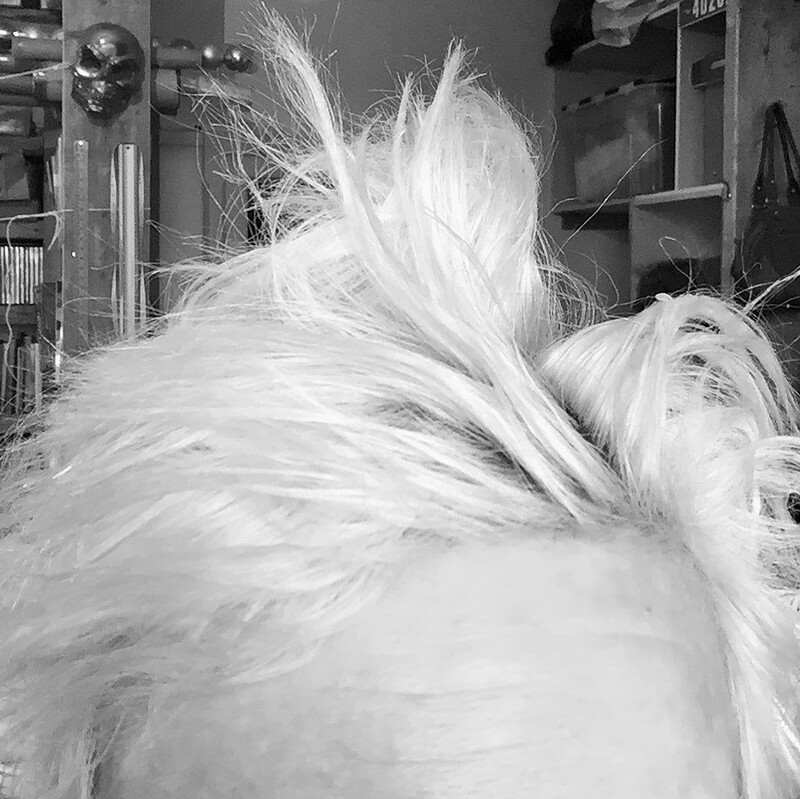 A day without even a little time spent with my needles or hook can be too long for my head. As you can see, I haven’t spun or wove since the beginning of the year. 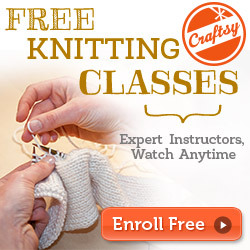 I have worked on other crafty pursuits which is great, but I desperately want to try and make spinning and or weaving part of my daily routine, in order to improve my technique. I also find I totally switch off whilst doing either, which equals a happy head too. The next section is all dedicated to the magazine, Leftfootdaisy stuff, social media and blog posts, which is why I know it’s been 17 days and having the chart hanging next to my desk has been a constant reminder. The next group of items are areas that I want to or should be watching. Walk the dogs, is so I do just that, it would be rare that I wouldn’t and if I couldn’t someone else would. Keeping tabs on it, just gives me that little extra nudge to do it myself. Washing (clothes not myself) is listed because it seems like my washing pile is never ending and I’m hoping that by seeing ‘washing free days’ it will help me to realise this just isn’t the case. The next few entries refer to actually getting in the car and leaving my house, it’s rural so you have to drive and although I’ll invariably have gotten out to walk the dogs it’s not really the same. Looking back at the last post, in which I mentioned trying to create some more ‘joy’ in my life, I thought it would be good to note how often I see my friends, even if it’s for the briefest moment. Bed before 12 – the X’s are because I haven’t achieved it. It doesn’t even mean bed and sleep, I’m just working on trying to train myself to actually go upstairs to bed before 12. Last item for this month says ‘read or listened to’, because I always enjoyed reading a book and can’t remember the last one I actually completely read. I started listening to audio books about a year ago as a way to fill this need, but even that has begun to fall by the wayside now I’m not driving backwards and forwards to Midleton several times a week. I’m currently listening to The Way of the Kings by Brandon Sanderson, all 76 chapters, 0r 45 hours and 34 minutes of it. I’ve a little over 33 hours left, but am getting a little confused with the names of the characters. I’m trying to read Greg McKeown’s book Essentialism, The Disciplined Pursuit of Less, but I haven’t managed to get that much read. The basic principle of the book is doing less, but better, which kind of ties in with some of the things I’m trying to fix. I’ve made my ‘Daily Habit’ chart available to download as a pdf if you’d like to try keeping a check on your daily routines here. For now I’m dreaming of knitting this yarn up into an Orbitus Hat for myself and working on my first prompt of the Ali Edwards One Little Word workshop. and thinking about my word FAITH. Doesn’t she and the view look lovely? Look a little closer and you can see it’s ice in the tyre tracks because it was freezing and bless her, she was sitting because she was tired (she only has 3 legs). I’ve been dying to tell you all about my trip to the knitting and Stitching Show at the RDS last Saturday, but had to wait until the magazine went live on Thursday. We had deliberately set our publication date for after the show, in order to shine a spotlight on the event, so I’ve had to stay shtum until now. It was rather a long day, having set off at 6.15am to meet my fellow knitty friends at 7.15 in Midleton, where we caught the minibus to take the 12 of us up to Dublin. The weather wasn’t so great on the way up, and after such an early start, it was important to stop off for refreshments. Having arrived in a very wet Dublin, we filled in past the poor people patiently queuing for tickets in the rain and headed in our separate directions. Some of us had booked into workshops, others just wanted an opportunity to peruse and some of us even managed to pop along for a quick visit to This Is Knit to make a couple of purchases too. I don’t think I’ve ever visited the Knitting & Stitching Show on a Saturday before, having had the shop in the past usually meant I’d get to pop up on a Sunday, when it’s a little quieter. Saturday was heaving and there were times when it was a little difficult to move. That number of people in a confined area is also going to mean warmth and boy was it hot. There were times when I’d have merrily stripped off and I did remove all knitwear, after I’d met the people I had wanted to. Talking of meeting people, I bumped into so many people that had been customers of mine in the shop and I was sad not to have enough time to catch up properly. I even found Moya from Patchwork Plus – Look at the stunning quilts behind her. 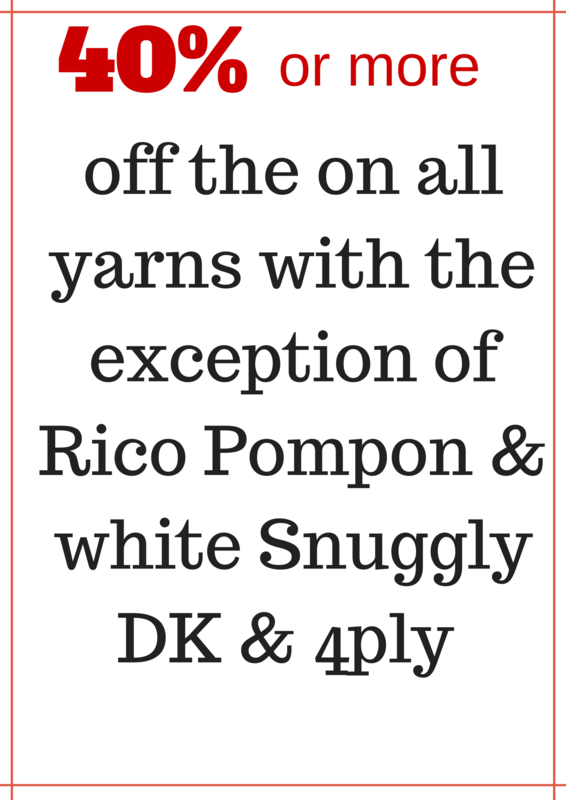 Having visited a good number of yarn festivals now, I had felt the RDS show to be somewhat lacking in the past and was worried it wouldn’t have enough to hold my interest for a full day. However, I was thrilled to see that there was a real buzz about the place and the energy of the visitors just added to the feeling. The exhibitions were incredible as usual, with such a variety of things to see and delight over. I always think it’s important to remember that the items on show are the exhibitors work and although invitingly tempting to touch, it should be avoided. I did notice one or two people unable to resist stroking, pinching and rubbing the displays and I also saw how agitated this made the exhibitors. It would be a shame if this put people off of showing there work in the future or if the work had to be cordoned off. Maybe, bigger ‘DO NOT TOUCH’ signs will be needed in the future to serve as a gentle reminder. There seemed to be a good number of workshops timetabled in, with all of them selling out quickly. Some were a little oversubscribed and space was at a premium, but I imagine this was probably an oversight. It would be great to know which classes were the most popular, so groups and teachers could work on trying to get courses in these areas together to run throughout the year here in Ireland. There were of course lots and lots of lovely, pretty things to tempt the Euro’s from your purse and despite having tonnes of stuff already, I did succumb, but only a little. How restrained was I? The linen type fabric was from Fabric Time and I’m going to make a smock apron dress thingy with it. No doubt they’ll be leftovers and I’m hoping to use them to make little lavender sacks for my friends (at some stage). The sari silk scraps and lime green fibre are to have a go at making some felted fabric. I absolutely adore sari’s and would love to wear one all the time. The colours and designs are truly inspiring and I’ve always been interested in crafting with these fabrics. So when I spied the Felt Creative stall I knew now was the time to try. 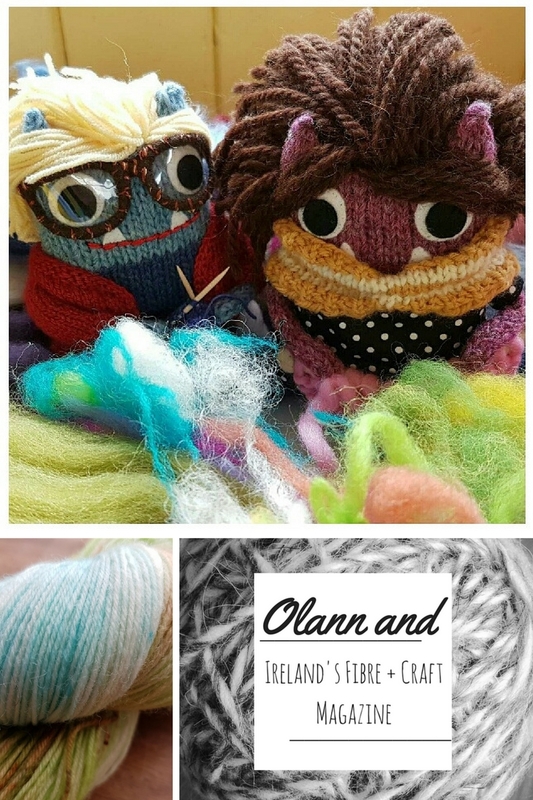 Of course there must be yarn and the hank of lovely rainbow goodness is from A Fine Fish Yarns who are based in Belfast. A latecomer to the RDS, three weeks notice I think, the stall was a riot of colour to tempt. I’ve bought it with socks in mind, but it may well become a shawl as it’s just so pretty. The green fibre was a freebie for taking out a membership to the Feltmakers Ireland guild. I’ve been following their exploits for some time now and thought a membership might be good way to stay up-to-date. Although with all my fibre exploits, I could probably do without another addiction. That awesome ball of turquoise and cream fluff, is 200g of merino fibre bought from the Bronte Glen and I haven’t got a clue what it will end up being, I just had to have some. I’m really looking forward to spinning it, but that’s as far as I’ve gotten, it may end up being knitted, woven or just looked at for a very long time. What you can’t see here in the photo, is the lovely bundle of scraps and off-cuts that I bought from the Magee Weaving stand. Their wool fabrics are beautiful and the stall was decorated with all of their bags, cushions and patchwork ideas. 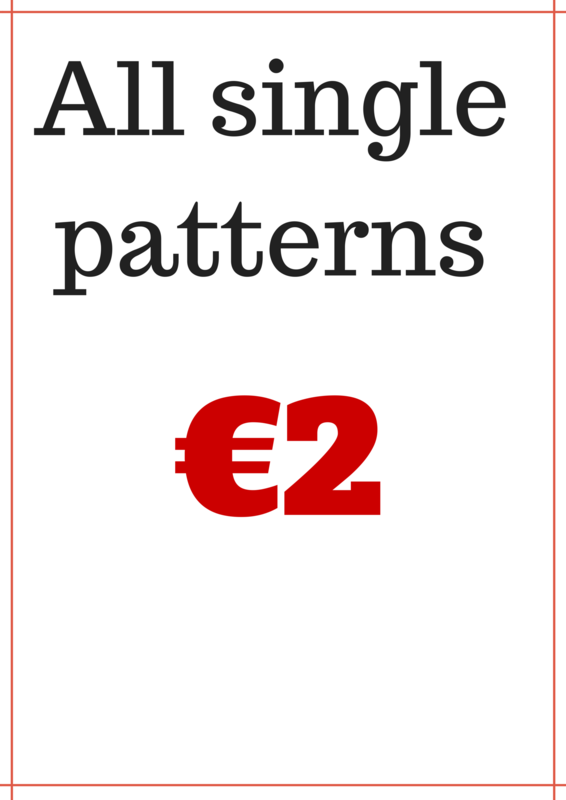 Having checked the Magee Weaving website I’ve found they do sell their fabric in bundles of fat eights, patches and lengths, but haven’t found any information regarding the kits and off-cuts so I’ve emailed them and will update this post when I hear back. As I said the day was a long one and we were all very grateful for being able to sit down and relax whilst Dave, our lovely bus driver delivered us home safe and sound in what can only be described as ‘shocking’ weather conditions. If you’d like to read a little more about the Knitting & Stitching Show in Dublin, pop over to our magazine article here. So the first issue of Olann and is due for release on Thursday – only 3 more sleeps and although we’re there with pretty much everything, it feels like there is still so much left to do. I have been sneaking in a little knitting occasionally (mostly by lamplight and often in the wee small hours. I added the red row to my crochet blanket last night, finally giving up at 12.20, when I’d completed the whole round. I look a mess, I’ve booked a haircut for Friday morning, enough is enough. My family, could do with a proper meal and my house, well, how about I show you how bad certain areas have become? Currently I’m typing this post at this. I barely have enough space to move. I only cleared everything off my desk on Thursday evening and I was out all day Saturday at the RDS, so I’ve no idea how it’s got so bad, so quickly. 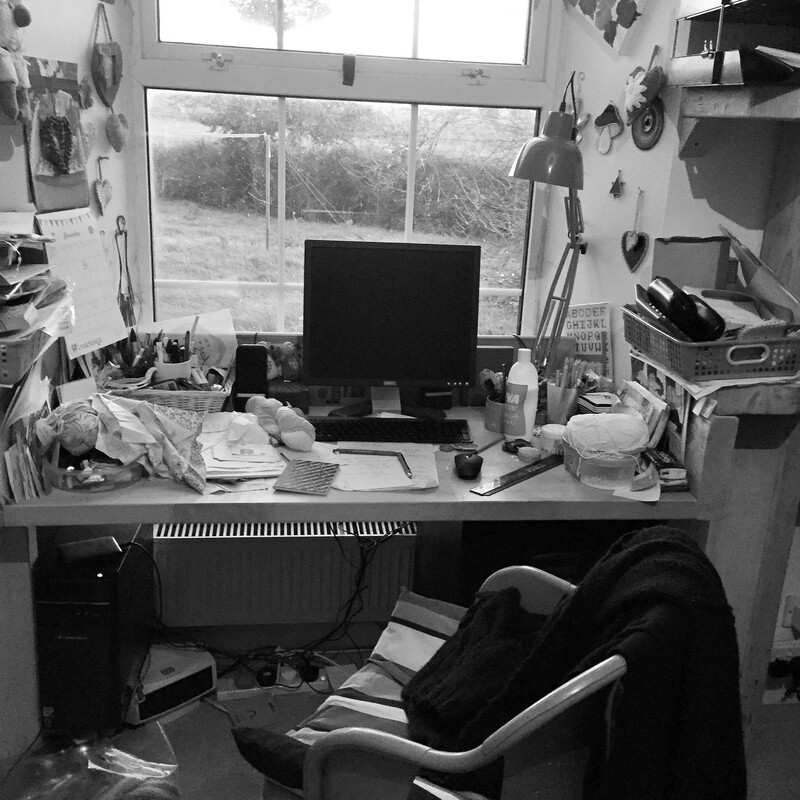 What you can’t see in the photo is that I’ve more piles of stuff on the floor to the left of my desk and then there’s a make shift table with piles of books, yarn and papers on it. 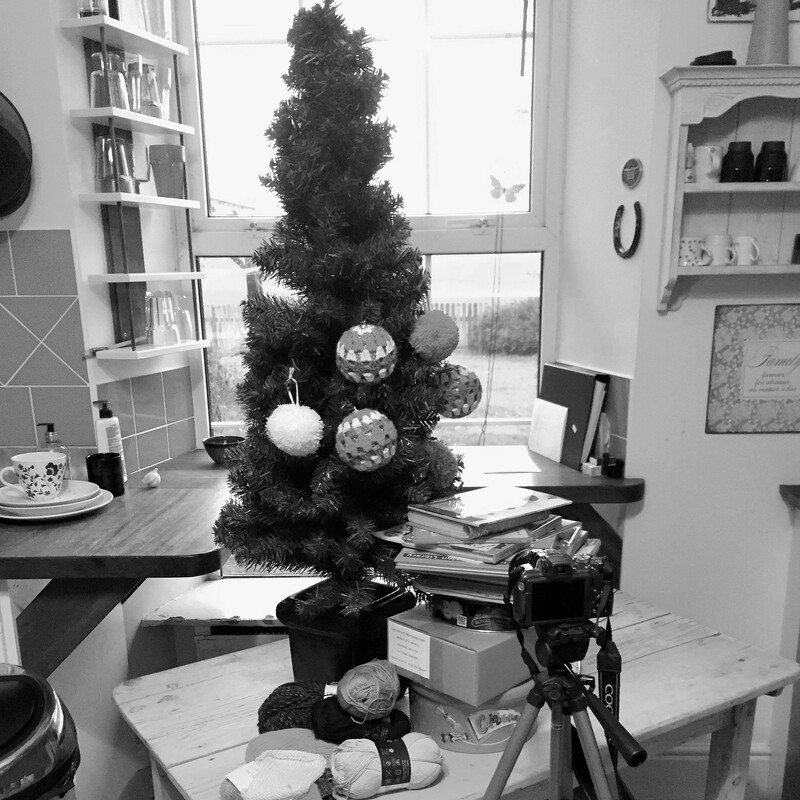 The kitchen has become a makeshift photography studio, the light is at it’s best in there. It’s completely in the way though, getting into the fridge is difficult to say the least. 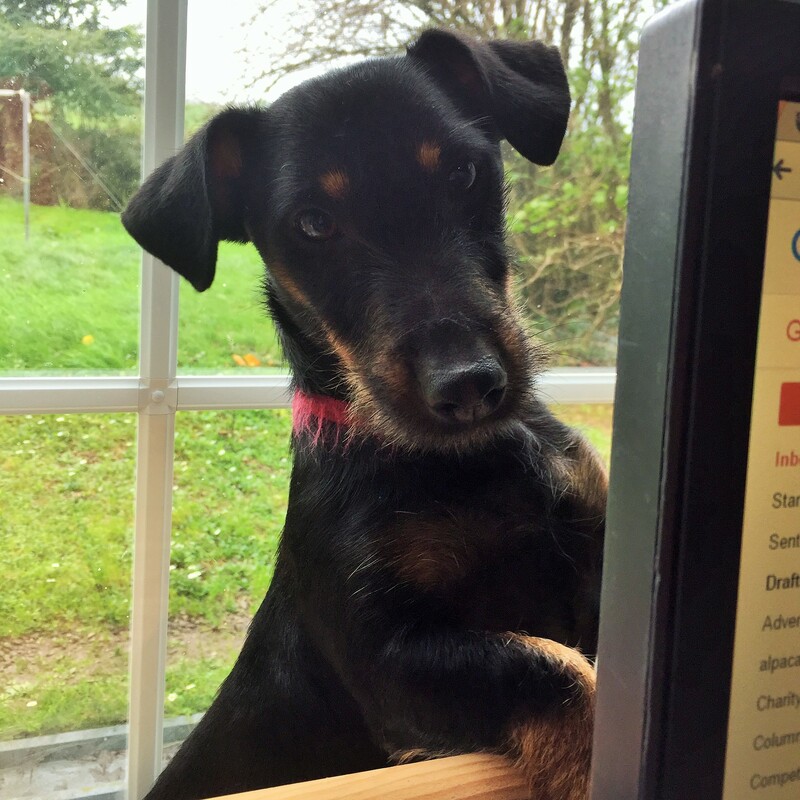 Think it might be time to take the dogs for a walk, someone seems to be growing a little impatient, Errol and the other three, get far too crazy to overlook this necessity. Nothing would be safe, if he wasn’t sufficiently worn out. Thankfully, living on the farm means it’s unlikely I’ll bump into anyone. 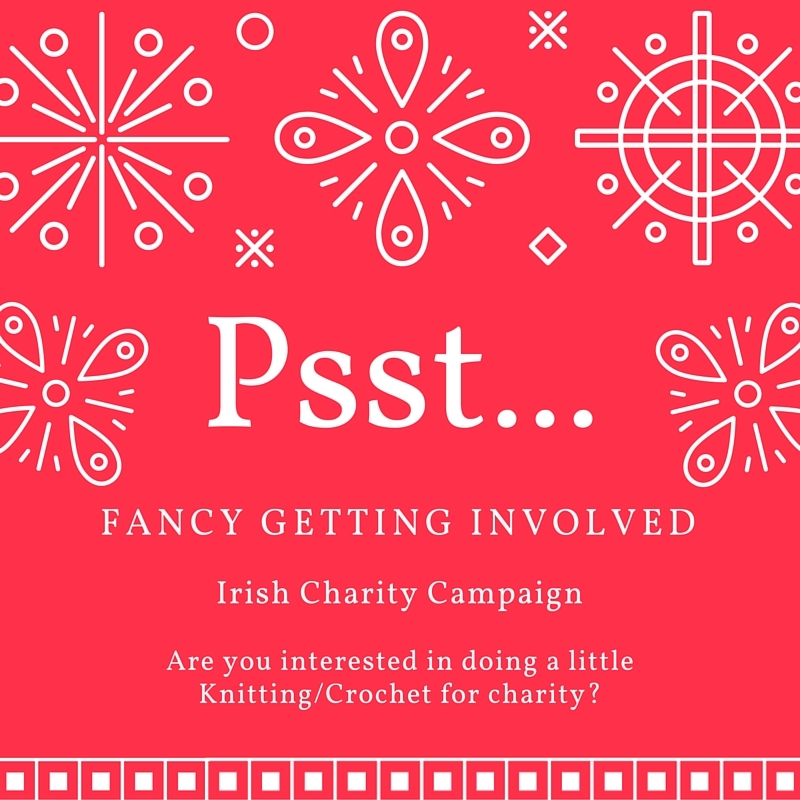 Psst….Fancy Doing a Little Charity Knitting or Crochet? In the past getting a charity knitting and crochet campaign off the ground was relatively easy. 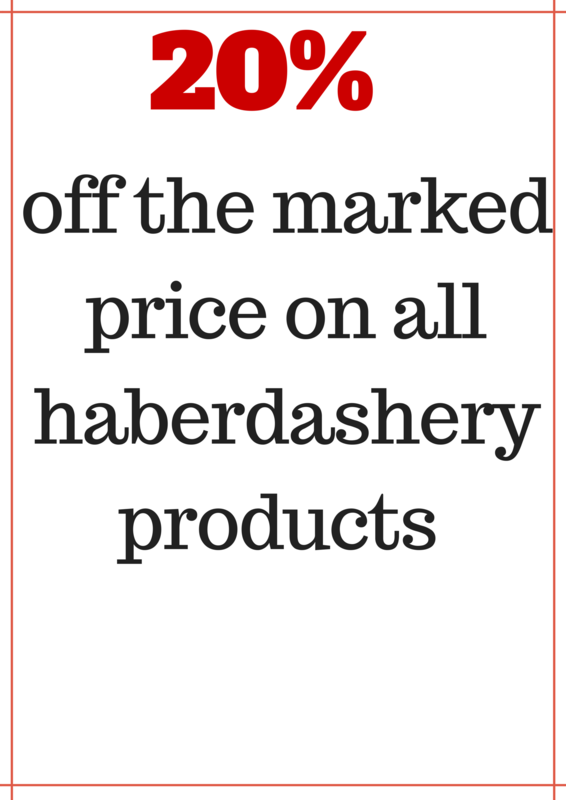 I had the shop and a lovely customer base, who spread the word high and low. Once I’d got everything together and had a plan in place, I knew I could rely on everyone to champion the latest collection. Whatever the cause, the response was always fantastic and every time, I was honestly blown away with the amount of work everyone put in. The charity in question, is an Irish one and they’re in need of a long list of things, woolly and not so woolly. So here in lies a dilemma and I’d love to hear your thoughts? How do we gauge interest? How do we collect the items and where are we going to put the drop off points? It can only go ahead with your help, so I’m looking forward to hearing all of your ideas. I know you’re all expecting a post about my exploits at Yarndale, but this is more important. 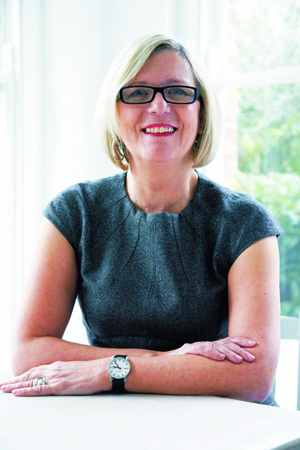 Debbie Bliss, has been a knitwear designer for over 30 years and was recently awarded an MBE for her services to the hand knitting and craft industry. Her designs are renown throughout the knitting world and include everything from classic shapes and beautiful baby garments to high end fashion knits and quirky accessories. I’m sure she needs no introduction, as most of you will have heard of her and many of you will have used her designs. Debbie will be appearing at three yarn shops, whilst visiting Ireland and is keen for the shops involved to use her visit as a way to support and raise funds for their charity of choice. As Debbie is extremely busy she will only be able to squeeze in appearances at three shops this time. The shops are, Crafty in Wexford, Vivi Trading Co in Kinsale and The Knitting Room in Malahide, all have promoted Debbie’s visit by way of a ticketed event. With the proceeds from the sale of the tickets going to charity. Debbie Bliss kicks off her whirlwind tour of Ireland with a visit to The Knitting Room in Malahide this coming Monday, 5th October. Tickets are €15 each, with 100% of the proceeds going to The Simon Community. Brendan from The Knitting Room said ” he couldn’t think of a better way to kick of the busy Autumn/Winter season, than with a visit from Debbie Bliss”. Debbie’s visit is also timed perfectly to coincide with The Knitting Rooms promotion of The Simon Community’s Winter Woolly Campaign, which Brendan and Carrie are fully committed to for the coming season. More about that to come in a separate post, but if you want to get involved now, you can drop off any warm, woollen items to The Knitting Room where they have a collection point set up. Clair Rooney from The Simon Community will also be in attendance at The knitting Room Debbie Bliss event, where she will talk more about The Simon Community Campaign. The tour goes from Dublin to Wexford next. Diane from Crafty in Wexford told me “everyone is really excited to have Debbie visiting the store. They are expecting a really great turn out for the day and are thrilled by the level of support from the local and wider community”. Debbie will be at the shop on Tuesday 6th October between 11am and 3pm. Tickets are €5 each, with all proceeds going to Wexford Hospice Homecare who provide an invaluable, home based Specialist Palliative Care Service in County Wexford. 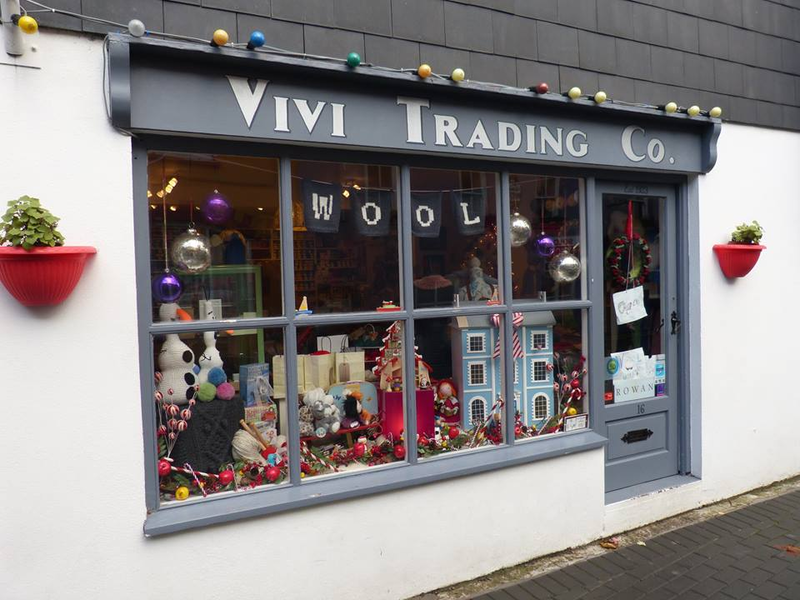 Last stop for Debbie is Vivi Trading in Kinsale on Wednesday 7th. The shop is hosting two separate events, one in the morning and another in the afternoon, in order to accommodate as many visitors as possible and raise funds for their chosen charity, Kinsale Youth Support Services who work to support young people and promote positive mental health in the local community. Tickets are €15 each with every cent going to the charity. For all three stops of the tour Debbie will have a good selection of her knitted garments with her for people to look at and try on and will be talking about her design process, great for all those budding knitwear designers among you. Quite by coincidence Debbie’s visit coincides nicely with National Knitting Week a UK campaign, with a slogan that’s close to my heart – ‘Commit to Knit for Charity’. 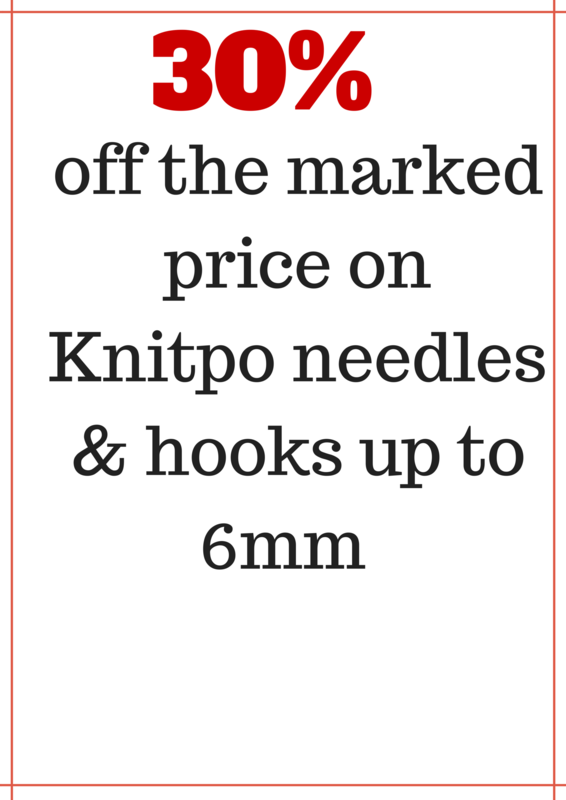 In the past, when we ran the charity knitting campaigns via the shop, I was amazed by the support these campaigns generated from the local, national and international woolly community, so I have no doubt that most of you will get your needles and your hooks out to show your support. There are lots of charities that need your support including the Annual Big Knit, many of the Maternity Units up and down the country are usually in need of premature baby knits (contact your local hospital to check first), Feileacain are sadly always in need of blankets. 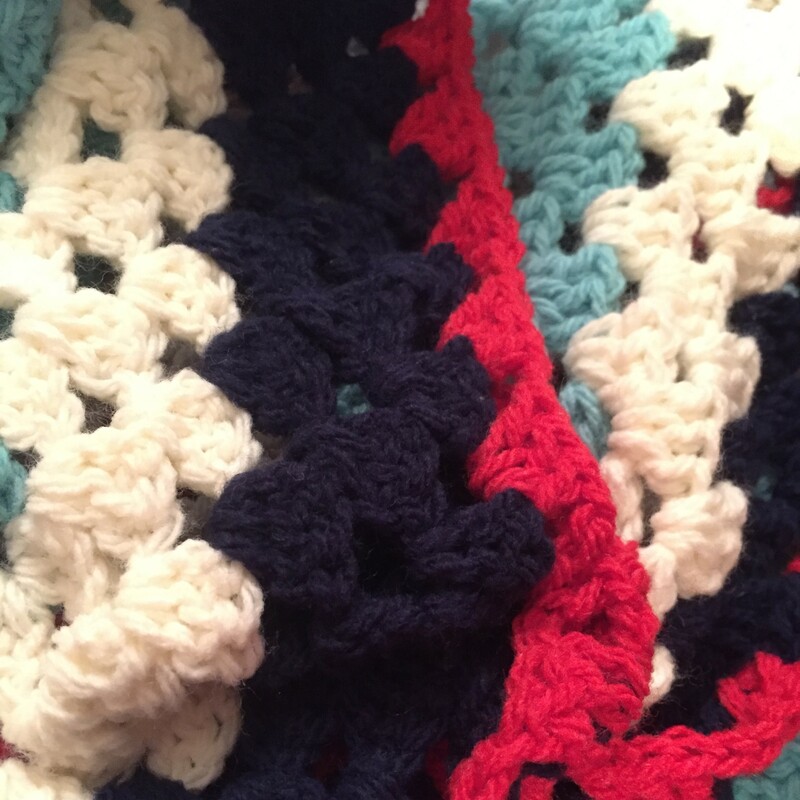 Knitted/crochet blankets are often wanted by your local animal shelters and community hospitals too, again it’s better to contact these directly to check first. I’ll get back to you all with more information about the Simon Community Campaign ASAP. In the meantime, maybe I’ll bump in to you at one of the Debbie Bliss events? You might remember I’d said I was up to something when I closed the shop? 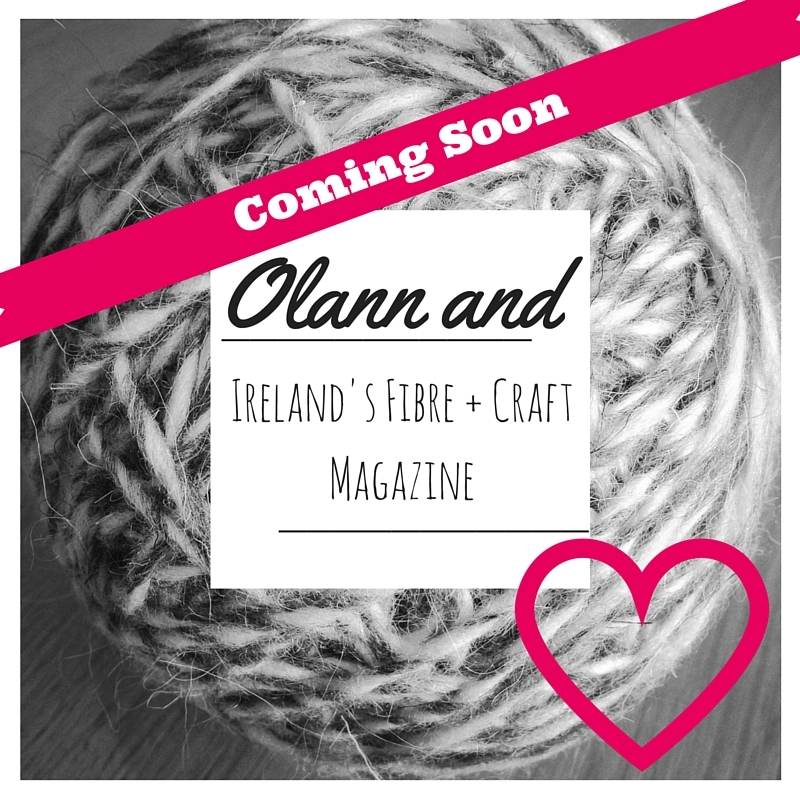 My very good friend Deirdre and I are happy to announce the upcoming lauch of ‘Olann and‘ an online fibre magazine focusing on the Irish market. We’re busy working on the first issue at the moment and it’s due out the third week of November…. yippee! 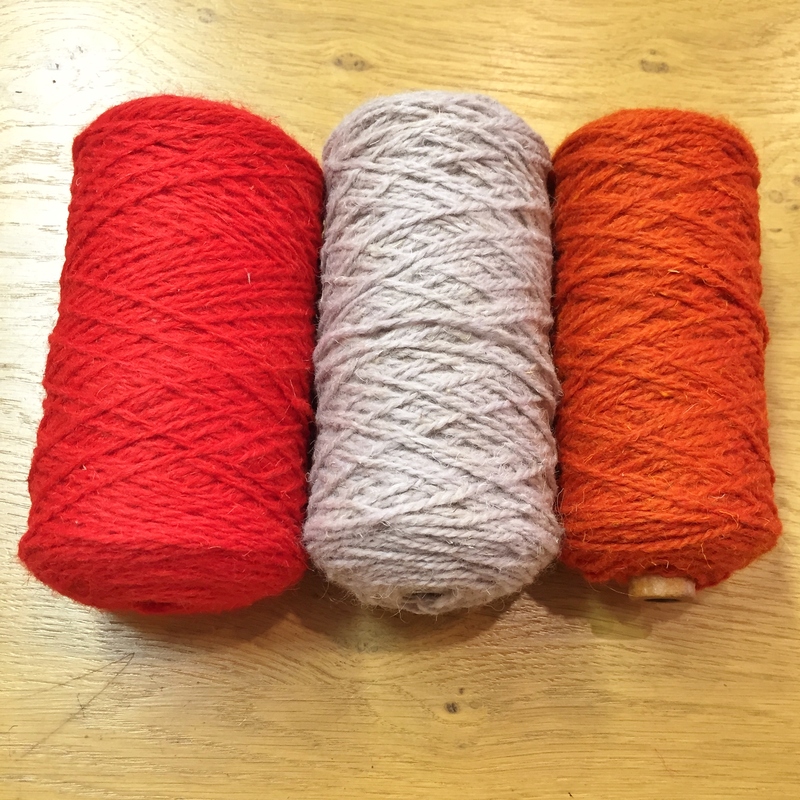 Expect loads of fibre, yarn and crafty goodness and we’d love to hear your ideas too. We’d love to have as many of you on board, so be sure to come and join us. A few weeks back when I was sorting out the discontinued shades of Sirdar Supersoft Aran for the now de-funked Green Bin, I noticed how lovely some of the colours looked together. 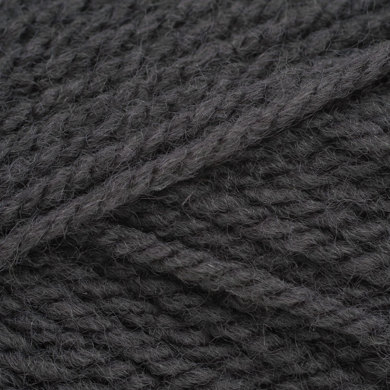 As Supersoft Aran is 100% acrylic, I knew I’d be able to work with it whilst suffering from my hayfever induced wool allergy, but didn’t know what to make with the 5 shades. I’m definitely not short of them for my sofa and whilst some of them could probably do with a bit of a refurb, I’ve already bought some fun, funky material that will brighten up my dark sofa. A chilly Sunday lead me to conclude that we don’t have enough blankets in my house. Being old enough to remember what it was like to have sheets, blankets and a bedspread on your bed and if it was cold, an extra blanket or two, I find it quite amazing that you never see ‘proper’ blankets any more. There’s no shortage of duvets in my house, but when you’re trying to convince yourself that it’s only forty winks on the sofa, a duvet can seem like too much of a commitment (or is it just me that thinks that?). So a blanket it is. 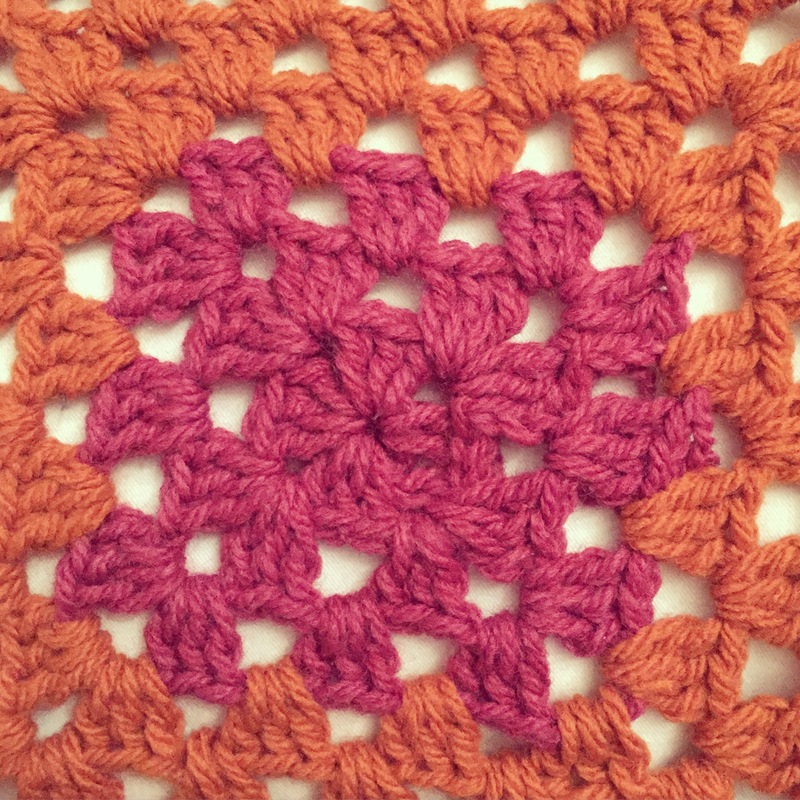 As much as I love the blankets you see on Pinterest and Instagram, with all the lovely little granny squares, I’m just not up for sewing in all those ends. 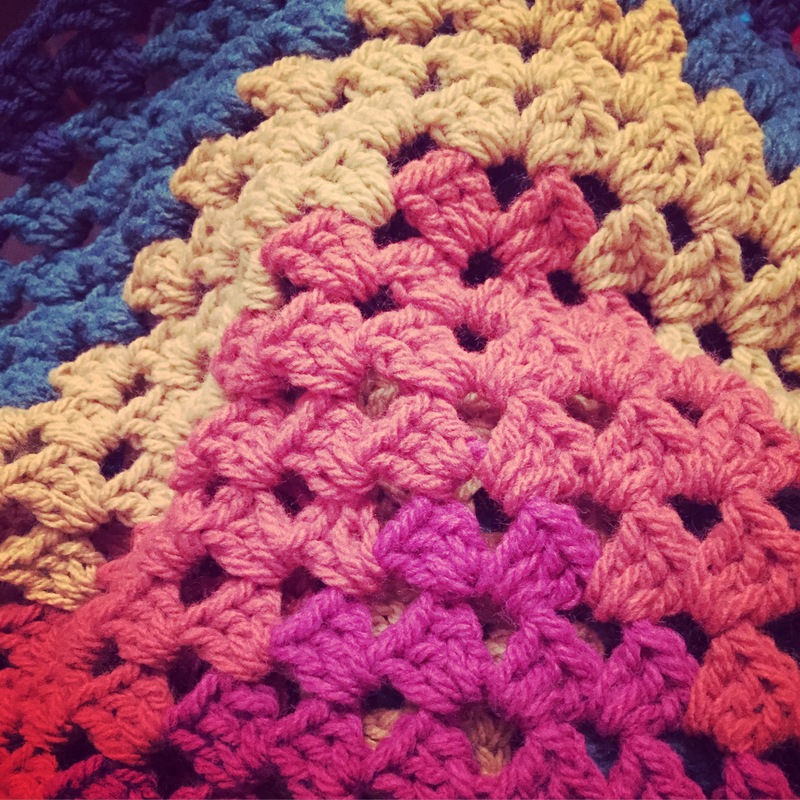 Conclusion – Big Granny Square (nearly typed knickers, aka Bridget Jones). 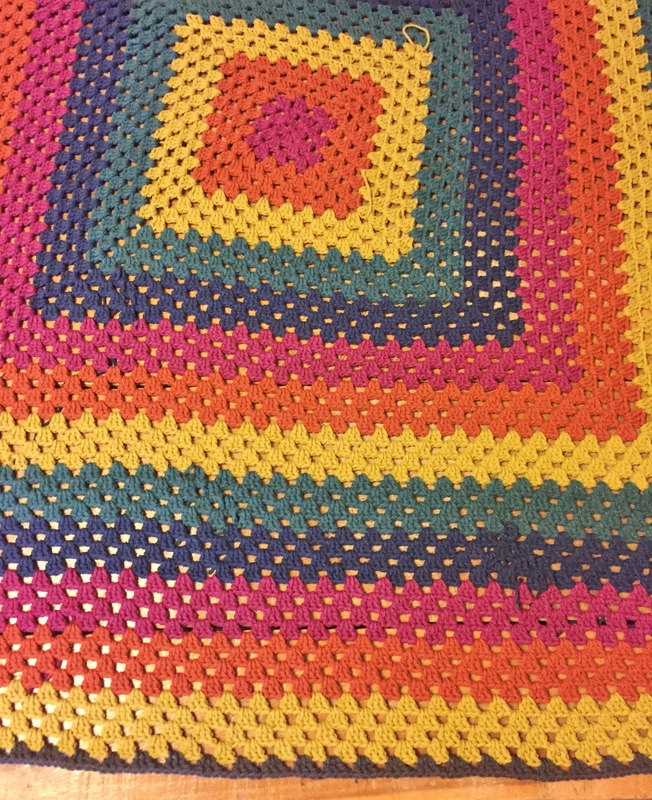 I started with 2 balls of each colour and knowing I wouldn’t have enough to complete three repeats of each of the five shade, I opted to only repeat the first three shades a third time. As it turns out, I needed an extra ball of the mustard colour to complete the last side of the round. I love it, but I want it a bit bigger and there’s no more green. 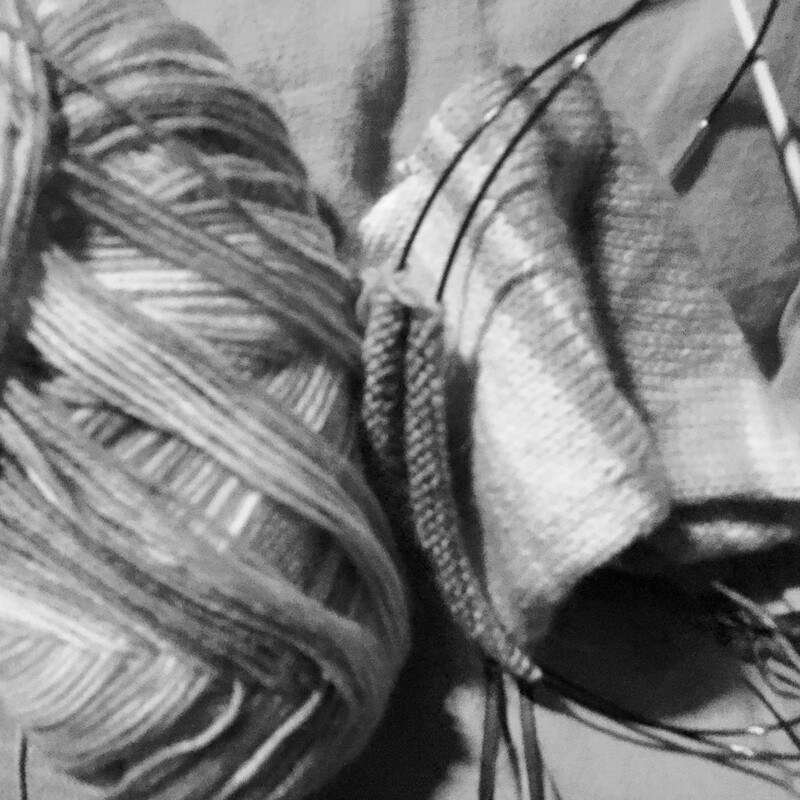 Luckily, I’d put by a couple of balls of the dark grey, which I think will work really well to frame the rest of the colours and finish of my blanket. Now all I have to decide, is how many rounds of the grey to do, all suggestions would be much appreciated. I was hoping to be able to hang the blanket up on the washing line, so you’d see it better, but it was awful in Lismore yesterday evening. 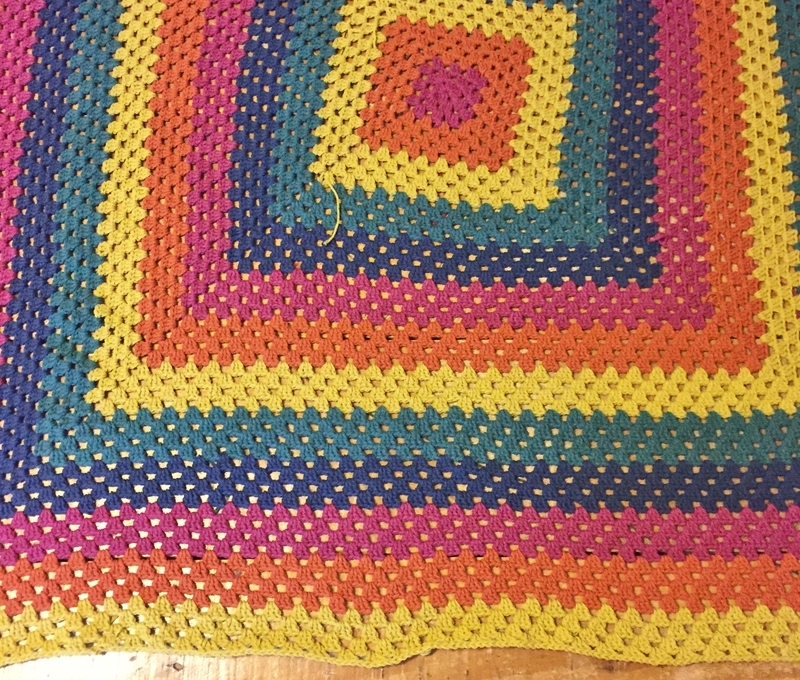 Instead I promise to photograph the finished blanket when the ends are sewn in and it’s washed. 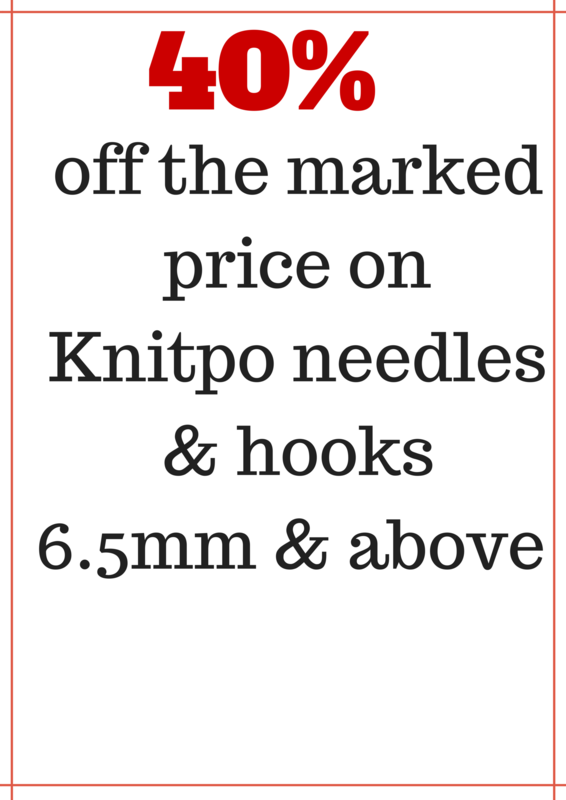 Nearly forgot, I’ve been using a 5mm crochet hook. Hopefully you’ve all had a little time to come to terms with the news in the last post 😦 Thank you for all your kind thoughts and words. So lets get down to it – I want to let you all know how and when we’re going to be closing. 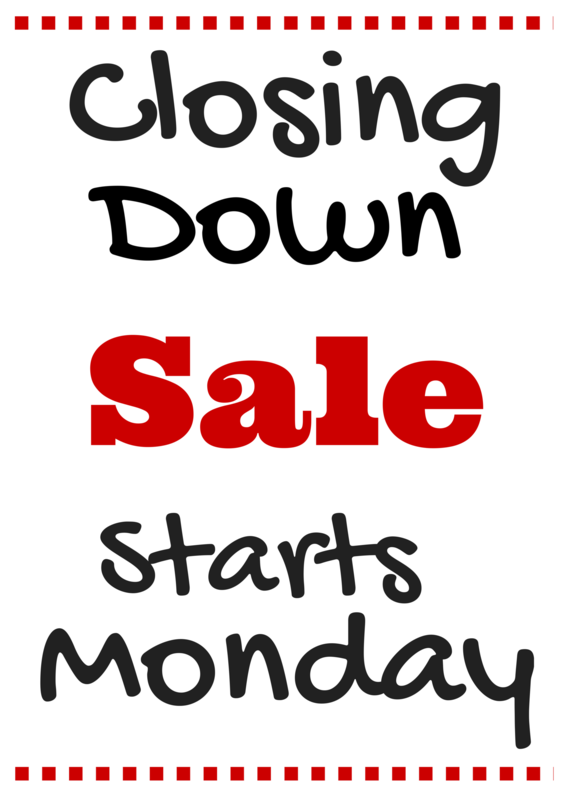 In order to try and clear as much of the stock as possible, I’m going to open up on Monday and will be open for most of the coming 3 weeks, although I will be closed next Saturday the 11th. 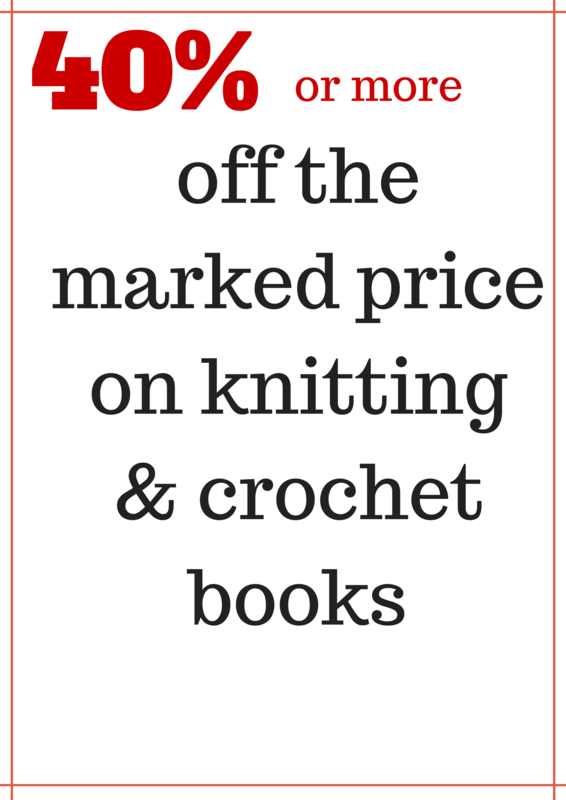 As you might expect, there are lots and lots of bargains to be had, so I’d advise taking some time to plan what you’re after, make a list and be sure to bring a bag or two. That’s the yarn and the patterns. 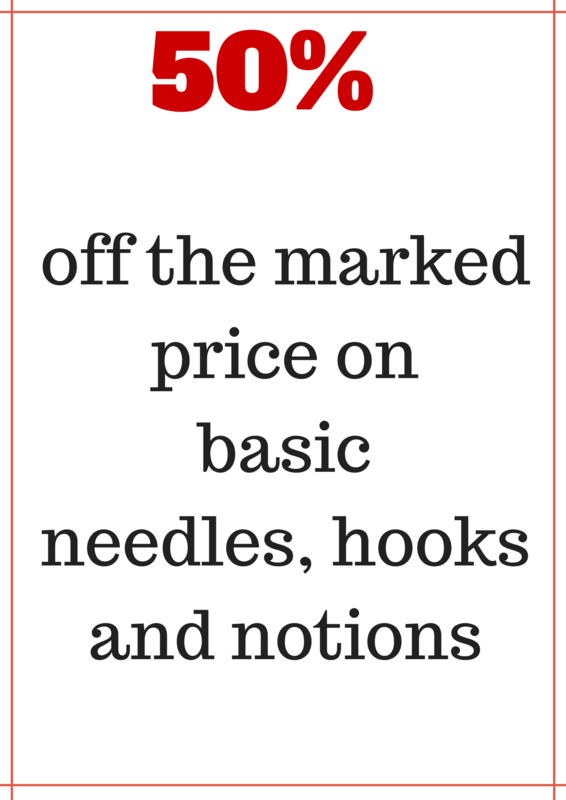 Needles, hooks and notions. Books need to go too. Please remember to dig out any gift vouchers you’ve been given, so you can use them before we close. All of the fixtures and fittings will need to be sold on too, so if you know someone who needs slat wall hooks, a till, vintage cinema seats or fancies my yarn units be sure to let me know. I’ve been trying to write this post for many hours, days in fact and I’m still struggling with finding the right words , so maybe I should just come straight out and say it, then explain? I think I’ve known it’s been coming for a long time now, but like most of us do when faced with a tough decision, have been avoiding making it. Now it seems that the universe has stepped in and taken over, the elements have all lined up and the conclusion has pretty much, been made for me. It’s been almost 10 years since my husband and I moved to Ireland and I opened my little shop in Dungarvan (I know some of you will probably be surprised to hear that I’ve been at this for that long). Since then I’ve moved premises more times then I, or my ever suffering husband care to remember, but I’ve always felt the shop was ‘home’ when we eventually came to Midleton. 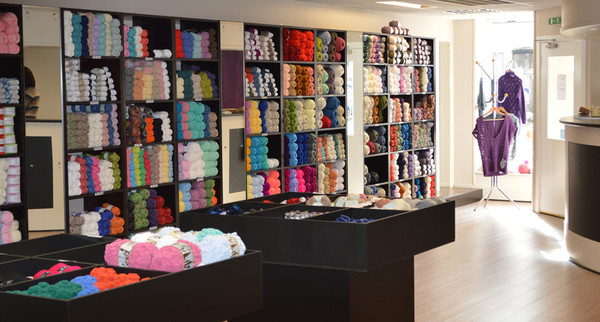 I can’t say ‘I always wanted to own a yarn shop’ because I’m not that kind of person, I’m not really aspirational, my life hasn’t worked out that way. I’m what most people like to refer to as a bit of a ‘hippie’ I guess and I just amble through life trying to do what feels right at the time. My love of all things crafty combined with the terror of moving to a new country and knowing I’d need to find ways of meeting people, resulted in the shop. Which several years later became the Knit you know and I hope, have loved? Throughout the 9 odd years I’ve been extremely lucky to have met some truly wonderful people and am blessed to be able to call many of them friends, lifelong friends too (I hope). It’s easy to take for granted how the people you meet can brighten your day and adjusting to life without the smiles and chat with my regulars is something that I know will take time. 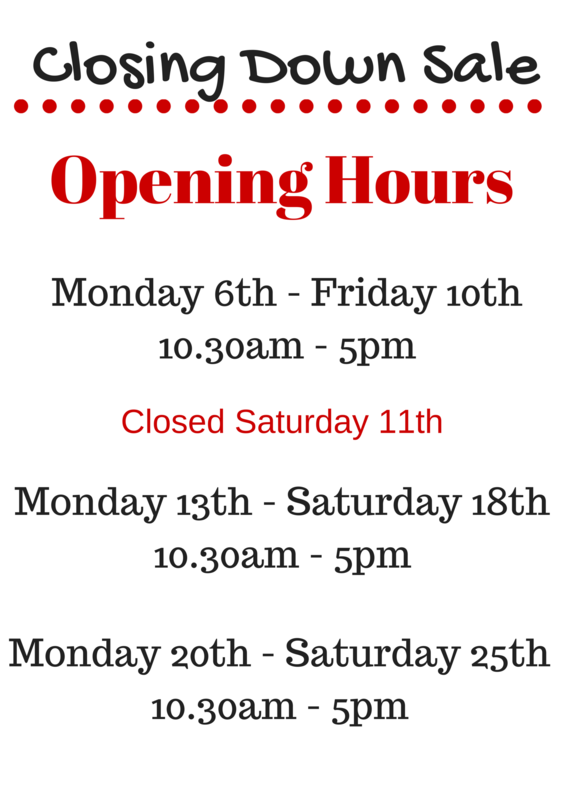 How we’re closing and when we’re closing are some of the more practical things I shall need to tell you about. I shall pop a separate post up about this over the next little while; I just have to finish typing it up. In the meantime I hope you will all understand that I don’t really want to talk about the why’s and where for’s because in all honesty closing the shop is not as a result of just one thing. You name it and it’s probably a factor – family, health, wealth and happiness there are changes happening in every aspect of mine and my family’s lives and this is just something that needs to happen. The Facebook page as you know it will eventually be going, but I shall still be on Instagram and blogging about my fibery exploits among other things. 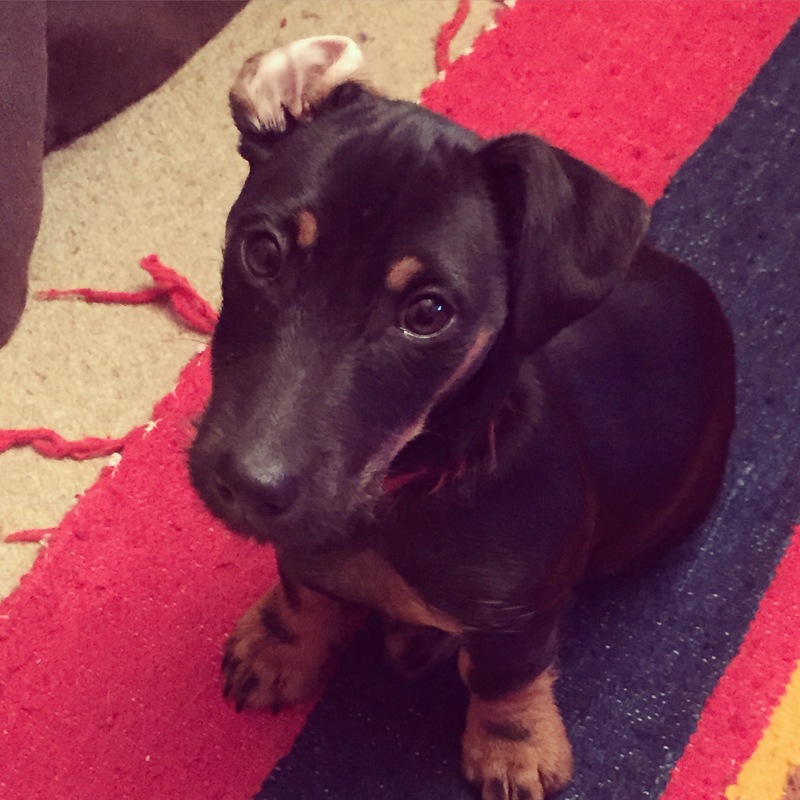 Hopefully a few more of you will come and join me here by following the blog and then we can keep in touch? 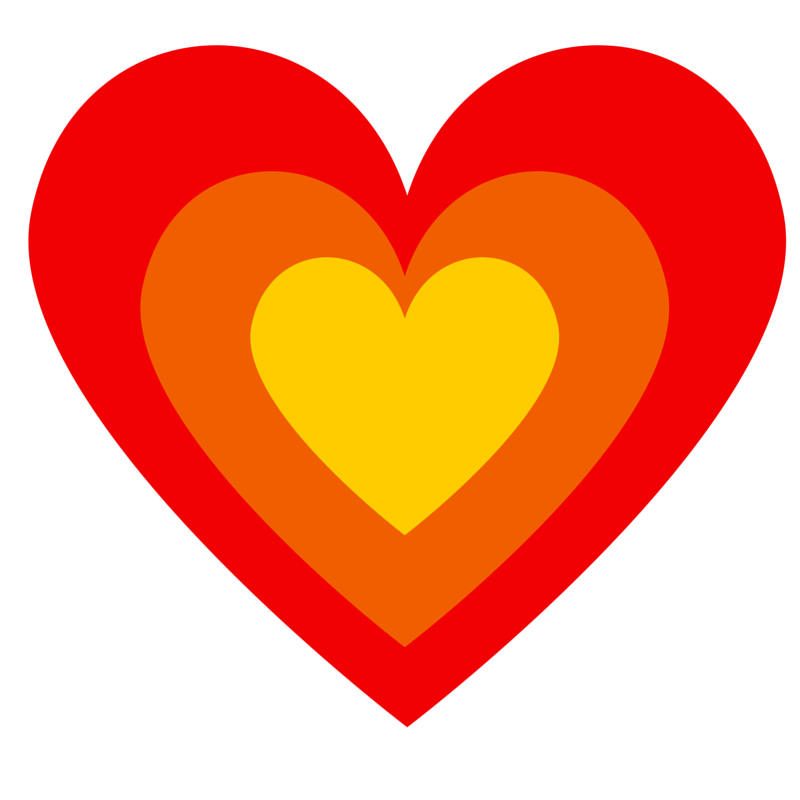 Most importantly I want to say a very big ♥ heartfelt ♥ thanks for all your support over the years. You might have noticed by now, that my knitting needles haven’t been getting much use of late? My poor puppy, ♥Errol♥ is having to make do with sitting on the sofa with me rather than on or next to me and the knitting, which is mostly pure wool, as it tends to be my favourite, is staying in my project bags most of the time. I’m rather ashamed to admit to owning quite a lot of fibery equipment that, in most cases, has never really been used. Some of them were ‘complete bargains’, gifts, specially made (sorry husband), or bought with the best intentions, but a lack of time to learn how to use them. 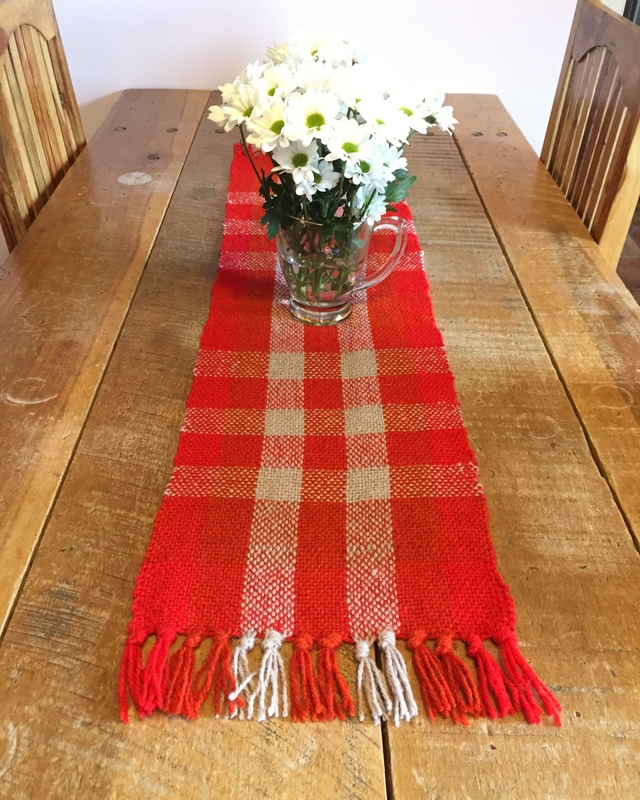 Weaving, is something I love and have been fortunate to attend a couple of tapestry weaving classes now and I always get far too carried away when I do basic weaving with the children I teach. Since Christmas we’ve made wall hangings and Gods Eyes and I’ve bought Hula Hoops to try and use them for a group project at some stage. So it probably will be of no great surprise for you to hear that I own a few looms? One of them is a little bit intimidating (a floor loom, disassembled and stored) and falls into the ‘absolute bargain’ category. 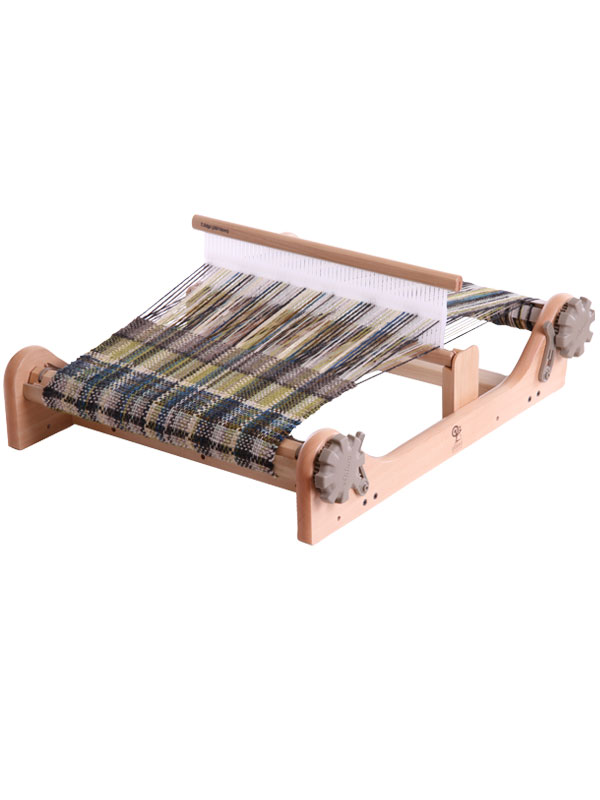 I also own a peg loom (thank you husband), several tapestry frames (husband again) and a Ashford Rigid Heddle Loom that I’ve been dying to play with if only I could find the time. Along with the ‘complete bargain’ loom, there were several boxes of weaving yarn, warp thread, tools and equipment, which all just added to the ‘deal to good to pass up on’ feel of the transaction many years ago. 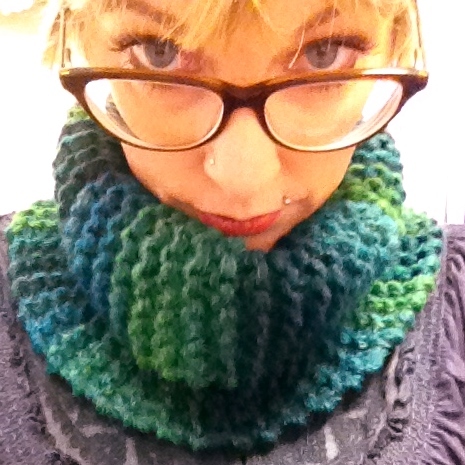 The yarn is mostly the heavy weight, rough rug weaving type of thing that makes your neck itch just looking at it. I love the colours though and find the more than slightly rustic look of the yarn, quite appealing, I just don’t see myself wearing it. 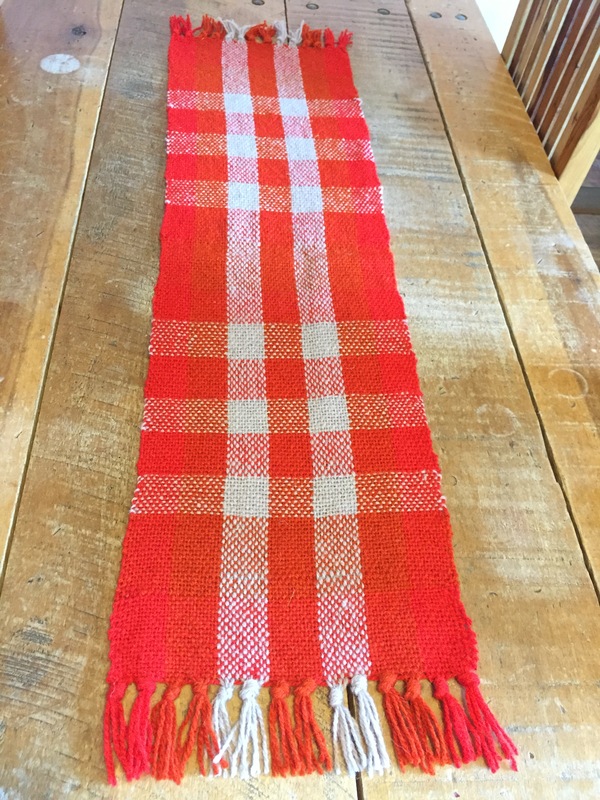 After selecting my three colours and watching the Ashford How to Warp Your Rigid Heddle video on Youtube several times, I began to warp my loom. 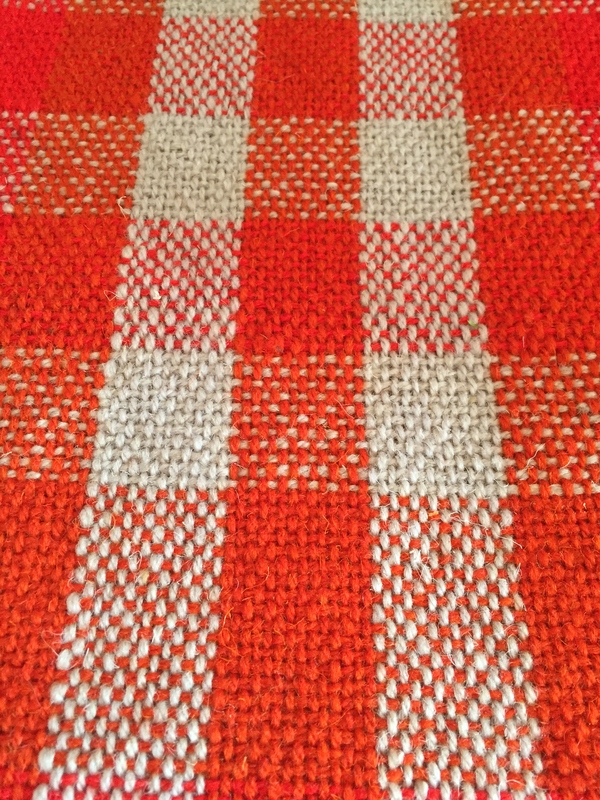 Having warped my loom, which took much longer than it should have, I was able at last to get on with some weaving. I completely forgot to take photos of the process which was more experimental than anything, but happily it ended up being usable. 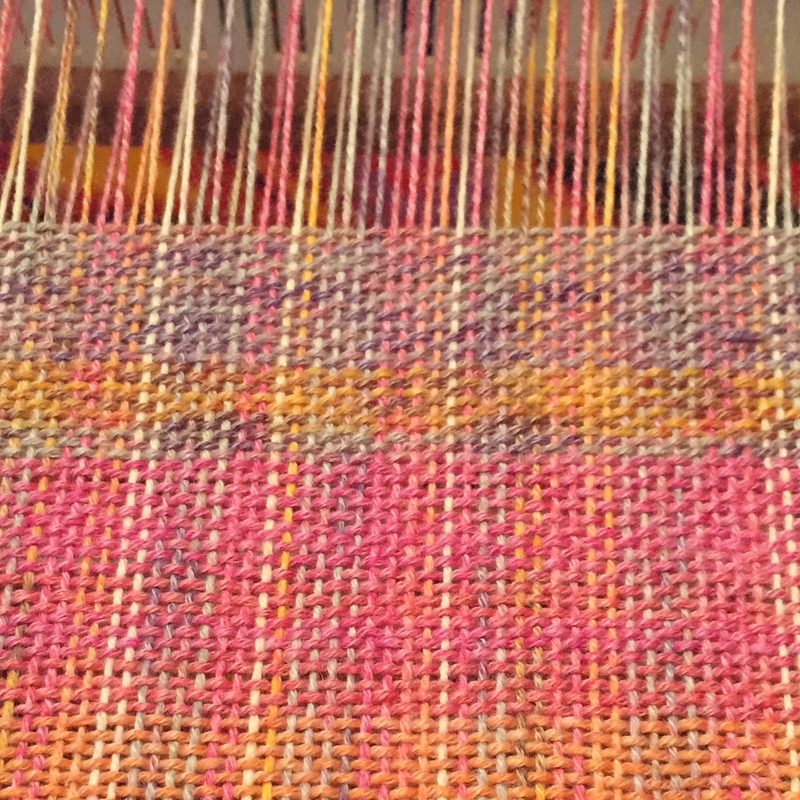 The weaving was an experiment after all, even the pattern ended up being a happy accident, one which just evolved and then I repeated. I think it’s rather lovely, even if I do say so myself. Look at those tassels too (don’t look too closely at my edges please). 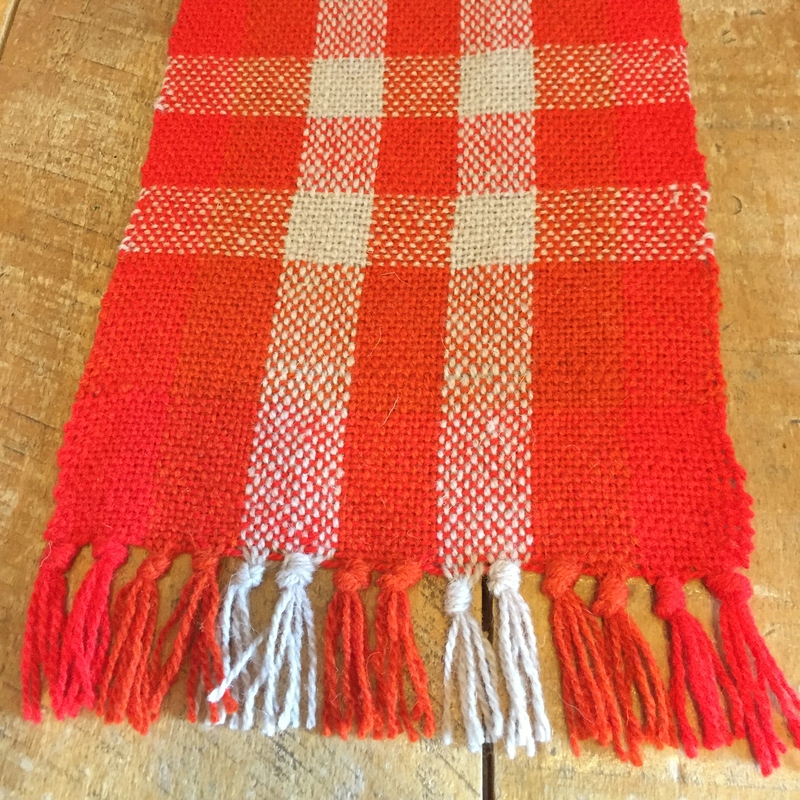 I found I’d enjoyed myself so much I couldn’t resist warping up the loom again. This time I’m using sock yarn and I’m hoping to make a scarf.